THE story of the failure of the reforms will not be complete unless we also take into account the failure of the privatisation of distribution. This is what we will examine in the second part of our examination of the power sector reforms. The distribution sector reforms are more difficult than inducting private sector in generation. The reasons are obvious. The distribution utilities are spread over much larger areas, they have to deal directly with the consumers, and have to distribute electricity to rural areas. The reason for choosing Orissa and Delhi for distribution reforms were that both had low agricultural loads. Delhi has very little agriculture. Orissa had done poorly in extending electricity to rural areas and had an agricultural demand of less than 5percent of the total demand for electricity. The Orissa distribution reforms started with the Orissa government unbundling the electricity board and privatising distribution. It came a cropper soon after, when AES, the US multinational, walked out of its commitments to restore power to Orissa's cyclone-hit areas. It had successfully bid for one of the four distribution companies that had been spun out of the Orissa State Electricity Board. 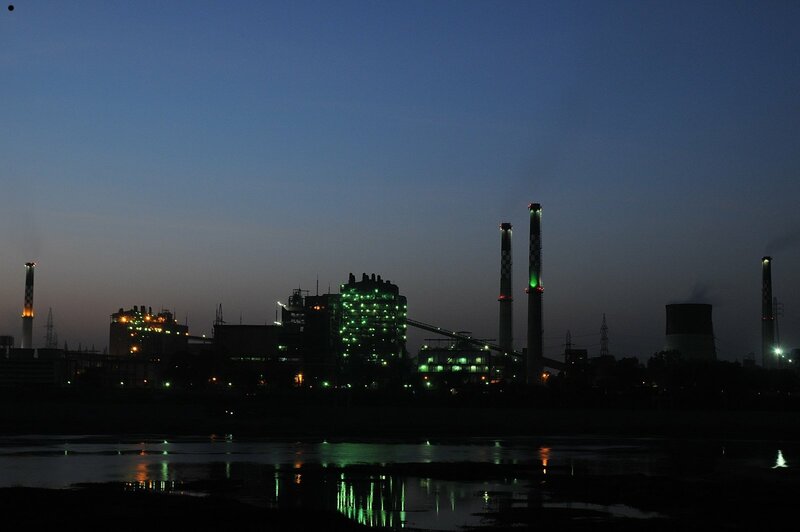 The other three, which had been taken over by Anil Ambani Reliance, continued for another 15 years – till 2015 – before Orissa Electricity Regulatory Commission finally lost its patience. The draft CAG report on Delhi's distcoms described the Rs 8,000 crore loot of consumers by Reliance and Tata. Though the final CAG report was withheld based on the High Court order that CAG cannot audit the distcoms, the fact remains that CAG audit laid out in detail the extent of the loot of the consumers by the private distcoms. It is the BJP backing the private parties and the tussle between Lieutenant Governor Najib Jung and the AAP government in Delhi that is preventing the cancellation of the licenses of the Delhi distcoms. With this, we have come a full circle on the electricity reforms introduced by the Electricity Act 2003, whose primary goal was to privatise the sector. The two examples of privatising distribution have both failed – Orissa and Delhi. All that remains is formal winding up of these private distribution companies and handing them back to public hands, as Orissa has already done. While the privatising of distcoms may have failed, there is another part of distribution privatisation which continues. This is to force the state owned distribution companies to provide “open access” to private power producers to supply power to big consumers. The industry and big commercial consumers have higher tariff. That is how we subsidise small consumers and agriculture. If the big industrial consumers can “buy” power directly and force the distribution companies to carry such power, with some nominal charge for the use of its wires, it will automatically push up the cost of electricity to the rest of the consumers; or increase the loss of distribution companies. This is indeed one of the reasons for increased losses of the distribution companies after the so-called reforms under the Electricity Act. Open access of allowing any large consumer to draw power from any generator on the grid is also treating the grid as a market, which it is not. It is a pure accounting myth that treats such supply and consumption, as if it is an actual transaction that is using the grid as a delivery vehicle for goods. In practice, the grid does not transfer electricity from the supplier to the buyers, but increases the transfers that have to take place from one region to another. The electricity grid was not designed to handle such transfers. The grid was originally designed to handle only regional shortfalls, and transfer of surplus to deficit regions. If it is to be used as a market, it has to be strengthened much more to handle much larger intra-region transfers. Otherwise, the grid becomes unstable. One of the reasons for the grid collapse of two years back, was such large transfers in the grid, reached not for meeting regional shortfalls, but for treating the grid as a market. Failing to address the underlying crisis of the sector, the BJP government is now proposing an amendment to the Electricity Act, the Electricity (Amendment) Bill 2014. This Amendment, is to take privatisation even further, delinking electricity supply to the consumer entirely from the electricity infrastructure. It will separate the wires of the distribution companies from the distribution of electricity. Distribution companies can then be privatised even further, becoming in effect traders, while the state governments underwrite all their operations by providing the wires, the transformers, the substations and high tension lines; or in other words, all the underlying electrical infrastructure. The state governments would have to put in all the investments, handle all the outages, while private “distributors” would use this infrastructure and essentially trade electricity. Why is this absurd step being taken? What the BJP government wants is to bail out private generating companies, who can take over “distribution” in lucrative urban areas. This will serve the dual purpose of providing a lucrative captive market for the excess capacity that the private generating companies have built, while leaving the loss making areas to be handled by the state government owned utilities. The rich, urban areas are insulated from the problems of the sector, get assured supply; the private players generating companies get an assured market; while the rest of the sector gets even deeper into crisis. Such a harebrained scheme has never been tried in any country. Hopefully, the Indian parliament will see sense and shoot down this utterly brainless scheme. When these reforms were introduced via the 2003 Electricity Act, most state governments did not understand the deeper game plan. This was large scale induction of private power into the grid which needed that private power tariffs be removed from political control of the states. The so-called independent regulator would create a “market” and would also remove all the subsidies for the poor and the farmers, so hated by the neoliberal establishment. The removal of the subsidies and that the state governments would have no role in setting the tariffs are all a part of the 2003 Electricity Act. From electricity being fundamental the country's development, we have now come to the point that it is just another set of goods, like soap or vegetable oil, to be bought and sold like any other commodity. What these set of reforms did, even where distribution was not privatised as in Orissa or Delhi, was that the share of power provided by NTPC and private power companies became increasingly more important in the grid. The state governments had now little control over generation prices, as more and more generation passed into the hands of the centre and private generators. Increasingly, the interests of the central government and the private players became aligned – both of them were essentially what are called Independent Power Producers (IPPs), companies that produce power but do not distribute it. The consequences of this unbundling and induction of private generators are now clear. 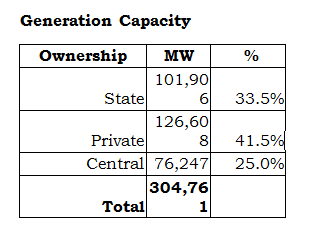 Currently, the private sector has an installed capacity of 41.5 percent (including renewables) in the grid. The centre has about 25 percent, while the states have now only about 33.5 percent of the generation, a fraction that is bound to come down even further with time. The state governments now have to distribute electricity at prices that are reasonable for the consumer, but have no control over its cost. If they increase prices, they suffer a political backlash from the people. If they don't, their losses increase. A simple look at the gap between the cost of electricity and the revenue realised per unit makes the direction in which the power sector is travelling clear. In 2006-07, this gap was about Rs. 0.26; today, it is roughly about four times or about a rupee. Not surprisingly, more the state government owned distribution companies sell electricity to the consumers, deeper they are going to go into the red. This is why the cumulative losses of the distcoms stand today at Rs 3.8 lakh crore. We are now at the crossroads of the electricity sector reforms. Either we realise that the underlying policies of unbundling and privatisation have failed completely; or we believe in the neoliberal mythology of the markets being gods. It is time to accept that the market gods have failed and go back to the understanding that the electricity sector is vital to the country’s development and its cost has to be within the reach of the people. The electricity unions have played a very important role in the past. They were the ones that warned the country about the disastrous Enron model of electricity sector reforms in the country. They were the ones who had resisted the so-called reforms of unbundling of the sector. It was an expert committee set up by the electricity unions that had discussed these “reforms” and warned the parliament and the country that this was a recipe for disaster, and that the losses would only increase with this model. The time has come again for the workers in the electricity sector to align with the people – the consumers – and bring about an alliance of the employees of the sector and the people. They need to explain why the electricity prices are rising and what needs to be done to bring down the cost of electricity. They need to combine with the bank employees union to argue that the so-called private generators should not own the generating assets, that have been built on loans which are nonperforming assets. Instead of writing off such loans, the banks should take over such assets. They rightfully belong to the banks. They should jointly oppose the schemes of parking such non-performing assets in a “bad bank”, which is meant to shield these private generators from the consequences of their loans. Mallya is not the only one with bad loans from the banks. It is time for the electricity employees to show the way out for the sector as it did earlier on Enron. It is not simply fighting the management of the sector, as is its “normal” trade union task. These are abnormal times for the sector and calls for extraordinary responses. This is the challenge before the employees, the unions and the people. This is our challenge. (This two-part article is from an address given to the All India Federation of Electricity Employees on November 13 in Trivandrum) The first part can be read here.